St. Thomas Lutheran Church continues to serve the community with weekly worship services at 10:00 am. This week’s visiting pastor is Rev. Charles Schulz. Come and join us for services this week at St. Thomas Lutheran Church, located at 10001 West Ellsworth Road, Ann Arbor. Maundy Thursday service March 29 at 7:00 P.M.
Good Friday Service March 30 at 7:00 P.M.
Easter celebration service Sunday April 1 at 10:00 A.M. There is an Easter breakfast at the church beginning at 8:00 A.M. at the church. Following our Vacation Bible School Summer Camp program on July 23rd at Freedom Childcare Center, St. Thomas Lutheran Church invites the public to a special outdoor service on Sunday July 24th, at 10:00 am.The service will be held at St. Thomas Lutheran Church. We will have a picnic lunch along with a hayride and other family activities for those in attendance. St. Thomas Lutheran Church is located at 10001 West Ellsworth Road, Ann Arbor. Saturday December 5th, starting at 11:00 am until 1:00 pm, the St. Thomas Women’s group will be hosting a Christmas Bake Sale. This will be at the Freedom Township Hall, on Pleasant Lake Road. Featured will fresh homemade German Pretzels, special German Christmas cookies and other baked goods, including home baked pies. New this year there will be a kids make it-take it craft table. Sunday October 25th, St. Thomas Lutheran Church in appreciation of Pastor Carl DeMeritt, held a potluck lunch to honor him and his wife Beth. As usual the potluck meal was well attended, with much food. The members of St. Thomas are so thankful, that God has sent us Pastor DeMeritt to be our shepherd. Please come to worship at St. Thomas on Sundays at 10:00 AM. We are located at 10001 West Ellsworth Road, Ann Arbor. We have Sunday School for children and adult Bible classes as well.If you would like more information please call 734-997-9116 or 734-879-0488. 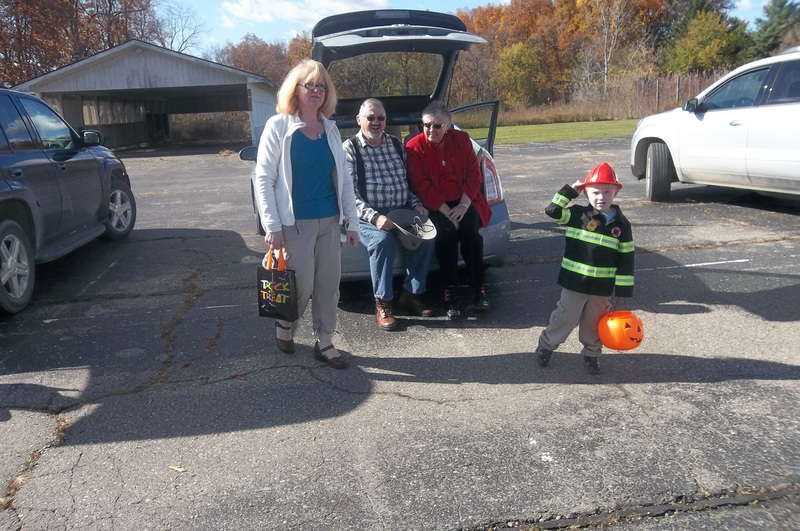 Pictured is Pastor Carl with his wife Beth with some trick or Treater’s at Freedom Childcare Center’s Trunk or Treat.